How Good is The iPad Air? If you have been reading this site over the past 2-3 years, you will know that my Apple fanboy-ism has declined rather rapidly. Apple, once a company that I adored, doesn't excite me anymore. They have become predictable in the extreme, and watching one of their keynotes feels more a rerun from last year, which was just another rerun from the year before that. Yes, the words are slightly different (iPad Air instead of iPad 2), but Apple is telling us exactly the same thing. Three years in a row they walked up on the stage and told the world that they had revolutionized the design and created something that was entirely new. Wow... that's ... so incredibly boring. And don't even get me started about the Macbook's. I can't tell the difference between my old MacBook Pro from 2009 and the one I bought in 2013. The difference in overall size is about half a centimeter, but other than that, they are completely identical. And then comes the software. Oh man... I don't even want talk about it. I no longer use any of Apple's software products. They used to be so great, and I used love Apple's software. But after the iPhone came out, they have been trying to simplify everything for the lowest common feature set spanning Mac OS and iOS. Just read my review of iWorks '13: "Apple, I'm not a simpleton." On top of this comes the closedness of Apple. Like when they suddenly decided that the iPhone 3GS couldn't enable wifi hotspot, or that sharing from Safari should only be allowed to the few companies that Apple has partnered with. It just infuriates me, and it's the reason why I switched to Android and my beloved Nexus 4 and Nexus 7 (which are now my primary mobile devices). All this said, I'm currently writing this article using my wireless Apple Keyboard (which I love), and my Magic Mouse (which is a billion times better than any Windows mouse I have ever used), on my MacBook Pro Retina (which I adore), sitting next to my Cinema Display (which I want to love, but it's broken...) ... and next to me are my Apple iPads and iPhone. All this is connected to my Apple Airport Extreme, which is bazillion times better than any other wifi router on the market. Talk about having a love/hate relationship. I hate where Apple is heading and their predictable boring and annoying closed-control-freakiness. But at the same time, I also absolutely love the extremeness of Apple's hardware engineering. It's out of this world in terms of awesomeness. Their attention to hardware details is insane, and I could not even for a second consider buying another laptop than a MacBook Pro. Here is a picture of the original iPad next to an iPad Air. Not only is it a billion times better, has a really good camera, much faster, and much longer battery life... but it's so thin that its only the size of what used to be the back bevel of the original. This is just crazy. How is that possible? And it's light too. The old iPad feels like a brick in comparison. It just blows your mind ... I'm speechless. I'm totally in love with Apple's engineering team. So here is what I did when I bought my iPad Air: I disabled iCloud, Game Center, and all Apple notifications. Then I moved all Apple pre-installed apps to a page far away from the home screen so that I never have to see them ever again. Next, I installed all Google's apps. Google Chrome, Gmail, Search, Maps, Google Drive and put them on my home screen. Then I installed my other favorite apps, like Feedly and Flipboard, Evernote, Kindle, Dropbox, Netflix, Paper from 53, Bamboo, iA Writer, and all the social apps (and a couple of games). This way I get the best of both worlds. I get the amazing hardware that Apple makes, combined with the wonderful world of 3rd party app developers who are making truly remarkable apps designed for real people ... and not for simpletons. And I love it. I love my iPad Air. It's wonderful this way. The same is true for my MacBook Pro. I have disabled pretty much everything from Apple, and are instead loving my life in the combination of Apple's amazing laptop hardware and third party apps. I no longer have any Apple apps in my dock. After the catastrophe that is iWorks '13, I moved all my creative work to Adobe CC (and I have long used Google Drive/Docs for writing articles... including this one). And that's the way to sum up the iPad Air. The tablet itself is freaking brilliant. The hardware has reached a point in which it's almost unbelievable what it can do in such a tiny and compact package. Have you seen Infinity Blade III? It's at the quality level of Skyrim. It's the same with 3rd party apps. I'm constantly blown away by all the amazing things tablet app developers create. There are so many truly remarkable apps out there, and even 3rd party accessories like the Wacom Intuos Creative Stylus. It's mind blowing that we have reached this point of sophistication in just so few years. And Google, I love you guys. If I didn't have Google Drive and all the other Google Apps on my iPad Air, I don't think I would have bought it. Google Drive is how I work. It's the only platform that allows my to work truly independent of devices, channels and people. Yes, the new iWorks also has collaboration, but it's a crappy form of two-way collaboration that only truly works one way. And that's the problem that I have with Apple. The hardware is wonderful to use in combination with the ingenuity of third party developers. But Apple itself is boring. 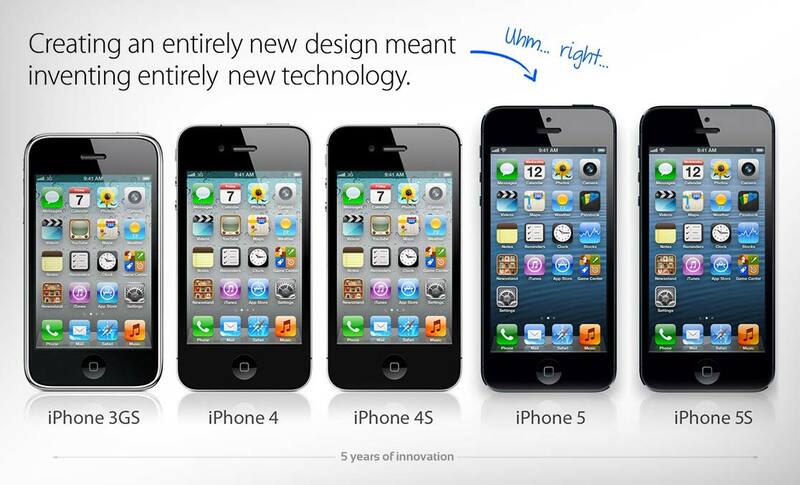 Every new device is exactly the same as the old one, which was exactly the same as the one the year before that. And Apple's software and services are heading down a path that I simply cannot accept. While everyone else take things to the next level, Apple is repeatedly trying to make us live in the past. Newsstand is for newspapers and magazines who don't understand the internet, same with iBooks Author. iCloud is for people who don't have any friends outside Apple (or even outside that one app), same with Facetime and Messages. iWorks is for people who don't actually work. And iTunes is for people who haven't yet discovered Spotify. Apple's notification center and control center? Well... is for people who don't know what Android is. Siri? Well... Siri is actually quite good, but Google Now is better. But the hardware... wow... it's amazing. If you already have an iPad 4/4S, don't bother. 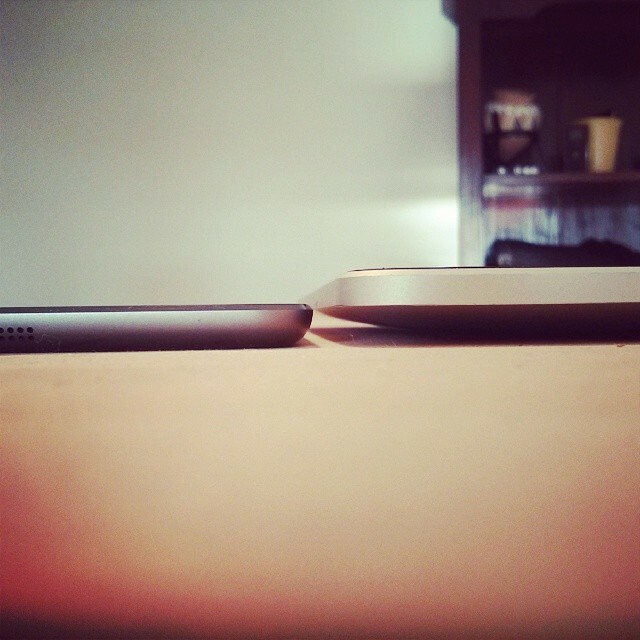 Yes, the iPad Air is slightly faster and slightly thinner, but you really won't notice much of a difference. If you have a really old iPad, it's a must buy. Really... just do it! But when you do, forget about Apple... move all the Apple stuff away from your home screen and download the many and much better apps from 3rd party developers. You will love the result. Super amazing apps that give you far more flexibility and awesomeness on a device that is incredible. I will end this with a simple question: If I were to drive out to one of my secret writing places, which device would I bring with me? Well... I would bring my Nexus 4, and then, depending on if the trip was planned or not, I would bring my iPad Air + my Apple wireless keyboard if I had planned it, and my Nexus 7 if I hadn't. The Nexus 7 is far superior in a snap, and it's a joy to write on by simply swiping the keyboard. But the iPad Air is better when it comes to writing with a wireless keyboard and maybe combine it with some sketching and conceptualizing in the Bamboo Paper app.